Founded in London in 2014, design studio De Allegri and Fogale works across multiple disciplines on projects ranging from industrial products and bespoke commissions to interiors and installations. 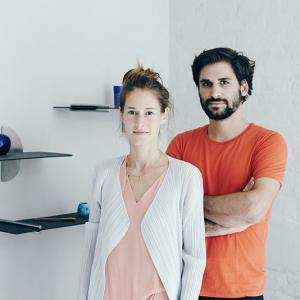 Cofounders and designers Laetitia de Allegri (born in Lausanne, Switzerland in 1981) and Matteo Fogale (born in Montevideo, Uruguay in 1984) are inspired both by nature and everyday environments, and they champion combinations of craft and industrial processes. Driven by the values of longevity, functionality, and sustainability, their design approach embraces unconventional materials as well as a constant, careful consideration of pattern, color, and texture. The pair first met in London in 2010 whilst working at Barber & Osgerby; each worked for internationally respected studios before deciding to join forces. To date, the studio’s standout projects include –ISH (2014), a collection of furniture and home accessories composed of recycled denim and postindustrial cotton and polyester remnants; as well as Mise-en-abyme (2015), a colorful, immersive installation on the bridge above the Medieval and Renaissance galleries at the Victoria & Albert Museum in London. Fogale studied industrial design at Università IUAV di Venezia in Italy and graduated with a Bachelor’s degree in 2007. After school, he worked on a variety of projects, ranging from high-end furniture and industrial product design to bespoke commissions with studios such as Patricia Urquiola (design intern, 2006); LKM Studio (graphic designer, 2007); Nichetto and Partners (senior designer, 2007–2010); Barber & Osgerby (designer, 2010–2013); and MAP Project Office (freelance designer, 2013 to present). In 2013, he established his own eponymous London practice. Between 2013 and 2014, he also collaborated with Joscha Brose on brose~fogale, a London-based studio focused on interior and product design, bespoke furniture, and installations. His work has been exhibited at designjunction at Milan Design Week (2013); at the clothing boutique Start London (2013) and Herrick Gallery (2014), both during the London Design Festival; and IMM Cologne (2014). 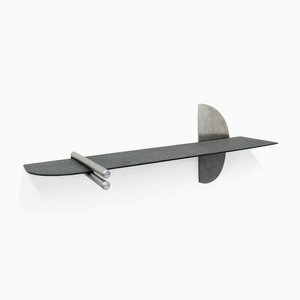 In addition to his design work, Fogale also works as a lecturer and model-making tutor in a variety of industrial design programs across the UK. Laetitia de Allegri studied industrial design from 2000 to 2004 at the Ecole cantonale d'art de Lausanne (ECAL). In 2003, she interned at atelier oï in La Neuveville, Switzerland. She graduated with a Bachelor’s degree in 2004. That same year, she moved to London and began working with key London-based designers on projects spanning products, furniture, and interiors, with a special emphasis on graphics and textiles. De Allegri worked at Barber & Osgerby (senior designer, 2005–10) and at Alexander Taylor Studio (part-time designer, 2010–14). Since 2010, she has also worked as an independent designer and color consultant for the likes of Marc Newson, Tom Dixon, Barber & Osgerby, and MAP Project Office. In 2013, she established her own eponymous studio in London. Between 2013 and 2014, de Allegri collaborated with German designer Eva Feldkamp on a pair of home accessories collections called Issue No. 1 and Issue No. 2. De Allegri has earned multiple awards, including a D&AD student award for the project Nesta (2002) and a nomination and distinction from the Lausanne Jardins competition for her design, On Stage (2014). Her work has been exhibited at the Musée de design et d'arts appliqués contemporains (MUDAC) in Lausanne (2004); Galerie Kreo in Paris (2005); the Milan Furniture Fair (2007 and 2014); and the London Design Festival (2013 and 2014). The pair lives and works in London.